Oh the joy of a summer’s wedding. The stillness of the air, the birds singing their bedtime tune and the atmospheric sky as the sun slips down past the horizon. Bunting adorns the trees and the walls of the bustling marquee as wedding music entertains the merry guests. This dreamy scene has been perfectly captured by the gorgeous collection of Portobello Pocketfield wedding stationery from Little Angel Weddings. Rustic in style and effortlessly chic, this design successfully captures that care-free vibe that you get at summer fete-style weddings. Oh we just love it! It’s so pretty and, do we dare say it? Girly! Depending on the design you choose (RSVPs, menu cards, order of service etc.) 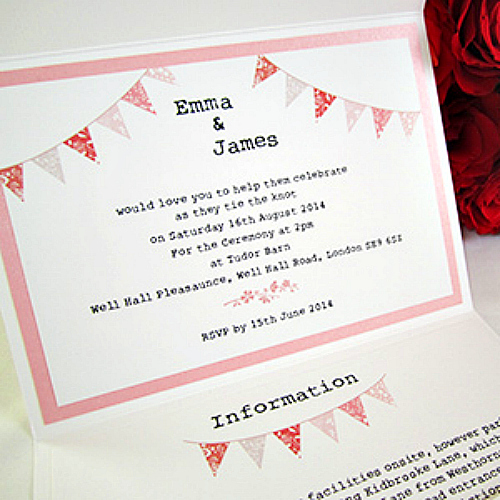 the bunting will compliment your information and adorn the corners of the card, as seen on the invite for example, or it will take centre stage in the middle, as seen on the place names. As the name suggests, the Portobello Pocketfold invitation comes in a chic folded ‘pocket’ envelope – pretty and practical! It also comes in three different sizes; 5x7in (178x128mm), DL (100x210mm) or square size (150x150mm). Because we know how important it is to have that personal touch, we’ve made it possible to change the colourways, the font and the card stock of this design, so it truly will be your wedding stationery. But if you want to take things further and add a bit more of your personality we can accommodate that too; you can add extra ribbons or diamantes as optional extras. Brilliant! So, if you’re someone who wants to exercise their creative flare, the Portobello Pocketfold could be perfect for you! Tip – Too feminine? Why not change the bunting to a shade of blue to inject a bit more of a male touch?